The grave of Madame Marguerite Rouffanche who died in March 1988 aged 91. She would not leave the Oradour area following the massacre and when the new village was built in the early 1950's, moved into it for the rest of her life. When she was buried on 25th May, Robert Hébras called for a minute's silence at the graveside. André Desourteaux (son of the Mayor) said that it was, "very hard, for when we carried her to the cemetery, we carried all of them". This picture was taken on Friday the 1st November 2002 (All Saints Day), hence all the flowers. 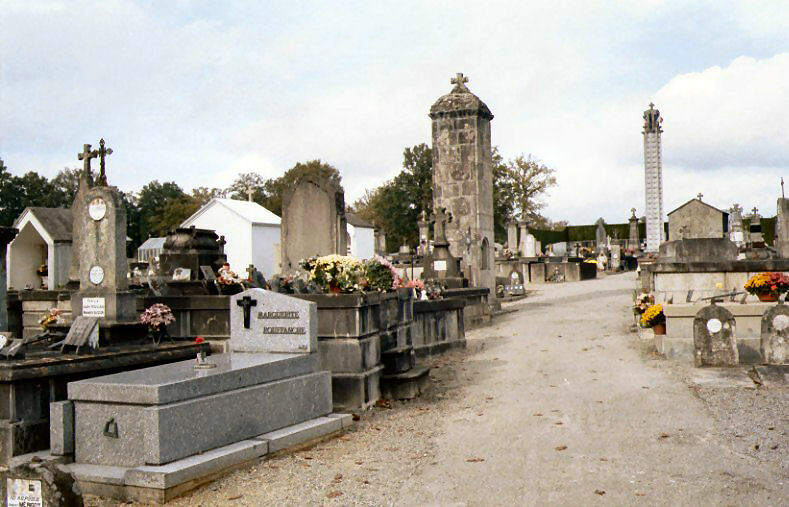 The stele of the main memorial to the dead of Oradour can be seen in the background.